We wanted to get our hike in early, and we had overnighted at the trailhead, so we were on the trail at 8:15am. 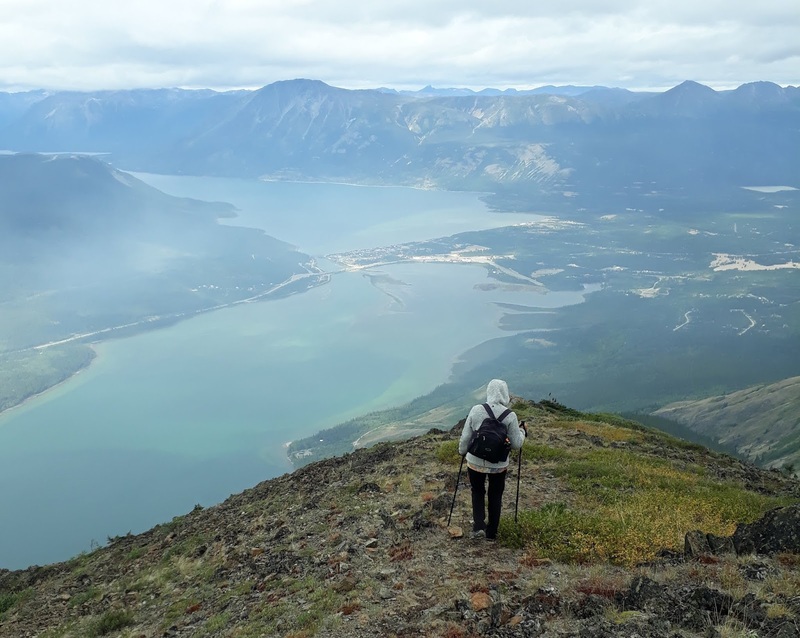 We've been using a great website called Yukon Hiking and they listed this trail as "moderate". Well, maybe it's moderate to a 25 year old, but for us we would have rated it "difficult". We sure wouldn't want to do a hike any more difficult than this one! It's rated as a 4.5 hour hike with a 3,300 ft elevation gain. It doesn't take long to start to get some great views. However, it was also a little smokey. There's a forest fire burning about 20 kms south of here and it was producing quite a bit of smoke that was coming our way. Uphill every step of the way! Yes, it was this steep! We were coming around a corner with open space on one side, and a bit of forest on the other. Ruth was in front of me when she spotted what she thought was a cat! But she quickly realized that it was a black bear cub! It disappeared into the forest so quickly that I only caught a split second glimpse of it. But where there is a cub, there is a mom. I quickly grabbed the bear spray and the air horn, with one in each hand. We heard some rustling in the forest, but fortunately I think they were more afraid of us than we were of them! Pretty sure they were headed away from us. We never did see the mom. We waited a few minutes, then took a wide detour away from the edge of the forest. Near the top, you can see on the right where the forest fire is originating. After 2:40 of steady climbing, we made it to the top! Time for a break and an early lunch. There are two ridges leading up the mountain, so we came down the second ridge. Good thing, because we think it was easier going up the left ridge, and down the right. It was still going to be very steep, but at least it seemed to have a better surface to keep your feet from sliding. Some great photo opportunities on this side of the ridge! Like I said, it was pretty steep. We made it back to Sherman at about 1:45pm. So in total, it took us 5.5 hours. Not bad for a couple of middle aged hikers! Then, we did some driving. We have to start heading south! Ruth spotted this bald eagle sitting on an electrical pole. We pulled into the Yukon government campground ($12) just west of Teslin. We're out of here early this morning because we have to be near another cell tower by 1:00pm our time! We've been invited to be on CBC radio this afternoon on their open line show "Cross Country Checkup". It's a long weekend here in Canada, and rather than discuss the typically bad news, they are doing a show about how to ditch your job and the rat race, and they're wanting to talk to people who have done just that! I guess we qualify! The show airs from 4pm to 6pm eastern time, and we are supposed to be on near the beginning. Beautiful views and pictures from the hike. Your both are in really good shape to tackle it good for you both. Now you will be even more famous once people hear your story on the radio. Congrats! Thanks Brigitte, the views from the hike were amazing. Another beautiful day! Kudos on getting up the mountain, I don't think I would have made it. Great pictures! It was a pretty good day weatherwise, it would have been nicer if the sun had been shining a little more but then we would have been to hot on our hike up or down. It would have been nice at the top though because it was pretty chilly while we were up there. It was definitely one on the more strenuous hikes that we have done in the last few years, I think. Nice hike but it'll probably take me more than five hours to do that with my left knee arthritis. Recently I climbed the stairs to top of the Colorado capital building and my knees were good to go at the end. I'll be 73 in Sept :-) so you have lots of years to do hiking. My grandmother still walked miles into her 80's...so I have a few more years too. Our clan name is Honighaani (one who walks around). As I relax in my recliner, ooooohing and aaaaahing reading this, looking at the photos gave me chills just thinking about heading back down that STEEP ridge!!!!! Congrats - well done!! You had it easy sitting there and watching our hike, lol! 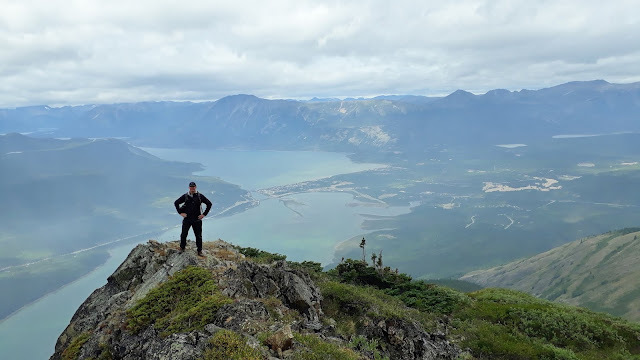 Yeah, even I was nervous about heading back down that steep ridge but I did it, slow and easy, that's my motto Kevin never seems to have a problem hiking down steep sections! Going up is hard work but I prefer hiking uphill over hiking downhill, at least when it is that steep. Listening to you both on Cross Country Checkup (CBC Radio) as i type this. Bless you both - living the dream! The interview starts at the 4:30 timestamp. Enjoyed listening to the Canadian Radio Show, and your interview was the best out of all the guests I listened to. However, I did not listen to all the guests. Your interview was very methodical as to how you reached your decision to go on the road full time. Some of the other interviews had a lot of "holes" in them, two in particular. There was one Canadian couple who was approximately 32 years of age and spent their life savings to own 50 acres and build a cabin in the middle of the acreage and, in short, occupy their time with ecological pursuits. No children were discussed in the interview; if they had them, I assumed they were home schooled. If they were going to have children, they were in their 30s which is about the last years of the "biological clock" to have a healthy child. Another lady was finishing up her Masters Degree in Sociology (about seven years of her investment of time) and stopped by this restaurant with a "wanted" sign for employment of a cook; she applied for the job and got it. Now, I have to ask my Canadian friends this question: Does Canada provide a free university education to your children? If so, the only thing this lady has lost in accepting a position as a cook is approximately seven years of her time in undergraduate and graduate school. But then, she may be a trust fund baby from her parents. Like I said, a lot of holes. In the US, one has to pay big bucks for an education at a university; and I had to take out a large loan to do it. Canadians pay for their own post-secondary education. Susan is correct, students have to pay for their own college or university education here in Canada unless they are able to get a scholarship or some may also qualify for a small grant that would help to pay for a portion of your tuition depending on your financial situation. Our colleges and universities are luckily not as expensive as some are in the States though. Was this hike more difficult than the one you did at the King’s Throne? Great photos as usual! Enjoyed listening to Cross Country checkup and hearing your voices. Yes, we both agree that this one was a little tougher. The hike was steeper and higher than the King's Throne. Listening to the interview was how we found out about you. I look forward to reading all your blogs. Good for you living your dream. Great to hear the radio interview! Absolutely stunning and what a hike. Great reason to inspire people to quit things and get on with life as soon as they can. Hardly anyone gets fitter or healthier as they get older and would miss out on more and more. Good for you two. It was a fabulous hike, a tough one but well worth it for the views. Too bad it was too smokey looking in the other direction because there were gorgeous views that way as well but the sun and the smoke didn't help with showing them off. I'm far behind on your blog posts, but wow! This was a gorgeous hike, even with the smoke. Very impressed as it definitely looked difficult to me. Steep!